“The Witch” (2016) Directed by Robert Eggers. Starring Anya-Taylor Joy, Ralph Ineson and Kate Dickie. A Puritan family in 1630’s New England leaves their village to establish a farm at the edge of a vast forest, where they become the easy prey of supernatural evil. Oh, and there’s a troublesome black goat causing problems. That was the sum of my knowledge about the story going into “The Witch,” and I’ll try not to spoil anything major for you. In the opening scene, a hearing is held by three rather stern gentlemen in regards to exiling a family from a walled plantation. It is never directly stated why these people must be cast out, but we catch on to veiled accusations of Godlessness. Like a much smaller version of the first dissenters to flee Britain and religious oppression, the brave clan leaves the known world of their peers and builds a tiny farm in a clearing near a forbidding and gorgeously filmed wood. The family consists of stubbornly proud father William and his wife Catherine, who privately fixates on her one fancy possession, a silver wine goblet, during the family’s poverty and hardship. Teenage daughter Tomasin, whose blossoming womanhood has caught the lustful eye of her younger brother Caleb, secretly desires to be wealthy and far from the constant work of frontier farming. Tomasin watches over baby Samuel while her younger brother Jonas and sister Mercy spend their days singing creepily worshipful songs about the incredible powers of Black Phillip, one of the family’s goats. Is Black Phillip really giving them lifestyle advice, as they claim? Pride, Avarice, Envy, Lust and the Worship of False Idols. This is quite a family. These people, with their imperfections, weaknesses and sin, become isolated from the rest of the world as their faith is tested to the breaking point and beyond. For deep in the forest lies a terrible secret, an ancient society of women in service to Darkness who have the power to cast illusions, control the beasts of the field, whisper lies into the ears of their prey from miles away and appear in a variety of forms. After losing a whole crop of corn to virulent black rot, and then losing baby Samuel under the watch of Tomasin, the family unit begins to crack. Tomasin’s guilt over having been playing peekaboo while Samuel was whisked away into the trees by a figure in red torments her, while Catherine begins to resent William for dragging them out to the middle of nowhere. Mercy and Jonas spend so much time absorbing the ambient evil of the forest that the very sound of a simple prayer causes them sickening agony. And Caleb? He just wants to hunt for food with the family dog, Fowler, and check out Tomasin’s bod in her very unsexy layered dresses. Soon, everyone is accusing the other of witchcraft after displays of otherworldly evil begin to occur on the farm. Mercy and Jonas say the villain is Tomasin, who claims that her younger siblings are in league with Black Phillip to subvert and destroy everything the family has built. Fear is a fertile breeding ground for violence. In 1999, after witnessing a fantastically executed hype campaign by the directors of “The Blair Witch Project,” I caught the film itself and came out terribly disappointed. It was beyond minimalist in its approach to the subject matter and critically praised far too much. When I sit down to watch a film about witches with the word Witch right there in the title, I want to actually SEE witches, magic, cackling, sacrifices, the whole nine yards. All of those things happen for you in “The Witch.” Even the cackling. Children are typically off-limits as victims of violence and death in horror films, but that’s out the window here. No one is safe, no matter how cherubic and innocent. Evil takes no prisoners in a film full of haunting images. One scene involving breastfeeding, which occurs late in the film, is unforgettable. And keep your eye out for old Black Phillip all you like. Distracting digital effects and blood-soaked massacres don’t drive this tale. There are a couple of bloody scenes, some violence and effects, but it’s a character driven piece and the performances are top-notch. Anya Taylor-Joy, with her angelic, expressive face, is a revelation as Tomasin. Her final furious scenes with her father William as her life unravels into suspicion, terror and guilt, are remarkable. She’s a talent to watch. Ralph Ineson as William and Kate Dickie as his weary wife Catherine are soulful in their ever-present state of grief and confusion. And Caleb, Mercy and Jonas are nuanced, subtle characters far beyond the expectation of actors so young. The entire cast exudes an authenticity faithful to the time and place, particularly with their accents and language, and the set design, costumes and props are flawless in creating the detailed illusion. You are in the 1630’s. Period. 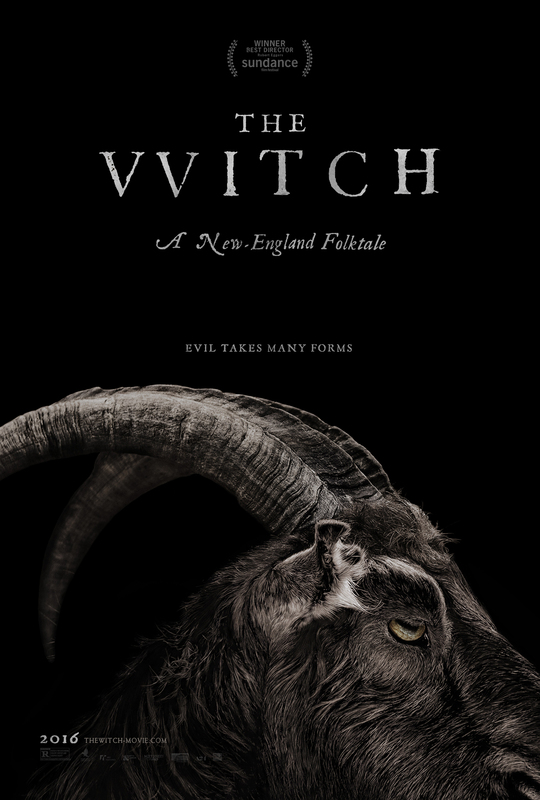 “The Witch” casts a different spell than many of the horror offerings of the last few years. It’s originality comes not from its concept but it’s unsettling tone. Many have thumped a bible and decried the innumerable evils of Lucifer described therein, and very few have faced these terrors in their most literal horned and crimson forms. In Robert Eggers eerie ode to Satan and his minions, the Devil is in the details. Tagged Black Goat of the Devil, Black Phillip, coven, dark forest, Darkness, evil witches in the woods, the Devil, The Witch, witchcraft.